You may not be aware, but there are USDA inspection procedures for mushrooms. Personally, I have performed a few official USDA inspections on mushrooms. The USDA has issued a U.S. Grade Standard for Mushrooms, unfortunately it hasn’t been updated since 1966. 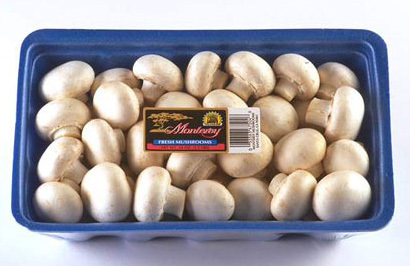 The grade standard was established for the inspection of white mushrooms, although the brown crimini can also be inspected using this standard. The USDA inspection instructions also include inspection procedures for all varieties of mushrooms, portabellas, shiitakes, etc. When inspecting mushrooms, the defect tolerance are based on a weight basis. 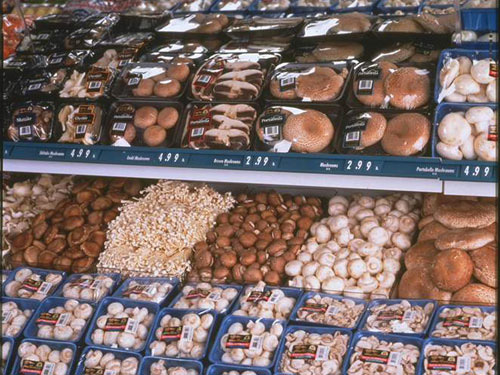 You would have to weigh out a sample of mushrooms, separate the defects, and divide the defects by the total weight of the sample to determine your percentage of defects. In the image above, you would your sample would be the entire consumer container. 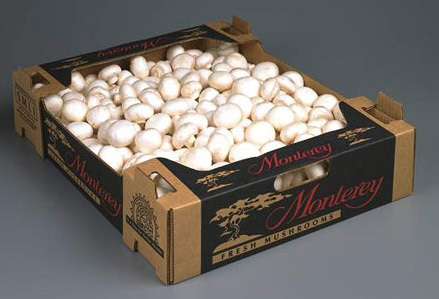 But what would you do if you were inspecting a bulk carton of mushrooms, such as this 10lbs. container pictured above? You would not have to sample the entire container, but you would simply weigh out 1 pound of mushrooms, and this would be one of your samples. The USDA requires all their inspectors to base their samples on a weight basis, but many industry inspectors in their warehouses will simply count out 50 mushrooms and base their sample on a count basis. If they found 4 mushrooms damaged by discoloration, based on a 50 count sample, they would record 8% damage by discoloration. How can one identify discoloration? The guide is so vague. Also is there a mushroom standard for maitake, shiitake, oyster, enoki? What causes the yellowing on caps of oysters and is that discoloration a? what is defined as discoloration? the standard is so vague? USDA guide references “Total defects, including 5%” but other tolerances like Open Veils is 10%. So does 5 % of anything not an open veil or sizing or decay fail to grade? Discoloration is a subjective defect. It will be darker in color, due to dehydration from age, or from bruising or abrasions from rough handling. Score as a defect when materially affecting the appearance. If you find more than 10% with open veils the mushrooms fail to grade. Any other defects, including decay, when exceeding 5% will fail to grade.